Understanding which metrics matter when developing strategies to keep learners on track can be challenging at best. There’s often an overabundance of data and far fewer insights than you would like. In this post, we’ll show you how to sift through the numbers to get the insights that you’ll need to develop a clear plan to help learners reach their goals. Are most of my learners leaving an activity at a certain point well into the course? Are struggling learners dropping out of an activity immediately after the first quiz? If the majority of learners who did poorly are not giving the activity another try, then they may have lost faith in the teaching style of the course. If your LMS allows you to quickly add curriculum components, then you might want to look at creating quizzes which cover less information and quizzing more frequently to reinforce critical concepts. Do high achieving learners begin to drop out with greater frequency as they near the end of the course? They’re bored with the curriculum. Use multimedia elements like video to make activities more immersive and offer users the option to test out of portions of the activity to study more advanced concepts. They don’t feel that there’s anything else to learn. Your learners may leave your course for another if they feel that they aren’t receiving value for the time spent. Offer learners an opportunity to unlock supplemental material covering advanced topics—such as videos, podcasts, or downloadable texts—after the completion of a series of assessments. They don’t think that they have the time. Use encouraging reminder emails to keep them up-to-date on their progress in the course and make it easy for them to see how close they are to fulfilling their CME requirements. Track Response Rates to Reminder Emails to Determine Learner Engagement. Are learners ignoring emails because of poor timing? While you’re most likely keeping tabs on the major holidays, but also be aware of timezone differences, and the best times to send an email. Are my emails ending up in spam because of confusing headlines? Jokes, wordplay, and terms of endearment may have a place in sales emails, but it’s best to keep your headlines clear and to the point. Am I sending a generic email that isn’t relevant to my learner? It’s important to be mindful of context when creating a reminder email. Sending an email that doesn’t speak to your learner’s specific circumstances will make it more likely that they will ignore the next communication. Engaged students will find your communications relevant because they see themselves as active participants in a meaningful learning experience. If formerly motivated learners—who have been zipping through activities without issue— are now treating your reminders like spam, then it may be your LMS itself that is at fault. If your support ticket volume is rising as your course completion rates drop, then it could be the structure of your LMS that is hindering the learning experience and alienating platform users. When users are frustrated with an LMS structure, they will be less inclined to return to the platform, and even less motivated to finish their course on time. “I don’t know how far along I am in the course”. Your users shouldn’t have to hunt to determine their progress. This should be the first thing that your learners are made aware of, and it should be included in your reminder emails as well. If your FAQ is leaving your learners with reasons to call support with basic questions, it is definitely time to rework your self-help structure. If you’re trying to manage all of these metrics on your own, manually, you may find yourself more than a little overwhelmed. One easy solution is to keep your learners on track is to use a full-service LMS which handles learner tracking, data collection, reminder emails, and even allows you to manage your curriculum from a single dashboard. With the EthosCE LMS, you’ll be able to easily update your activity with new quizzes and or add multimedia components to keep your learners engaged. You’ll also be able to automate feedback on user actions (such as reaching a course milestone or entering a wrong answer into a quiz) and track their time online to get a clear portrait of their course engagement. The EthosCE LMS provides you with the metrics that matter most, helping you save time and focus on developing exceptional learning experiences. 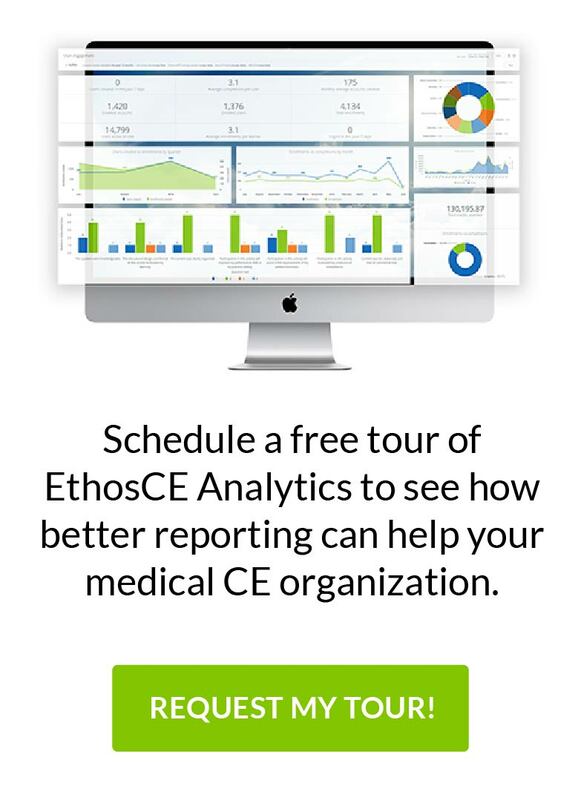 If you’re ready to see how EthosCE helps CME tracking, request a 1-on-1 walkthrough here.